Wow, it's been a while since my last blog! The past few weeks have been pretty busy... I was in a play at the end of July/start of August and last weekend we were at Bloodstock festival. I think I've only just recovered! It was lovely to arrive home to a new box from The Vegan Kind though! 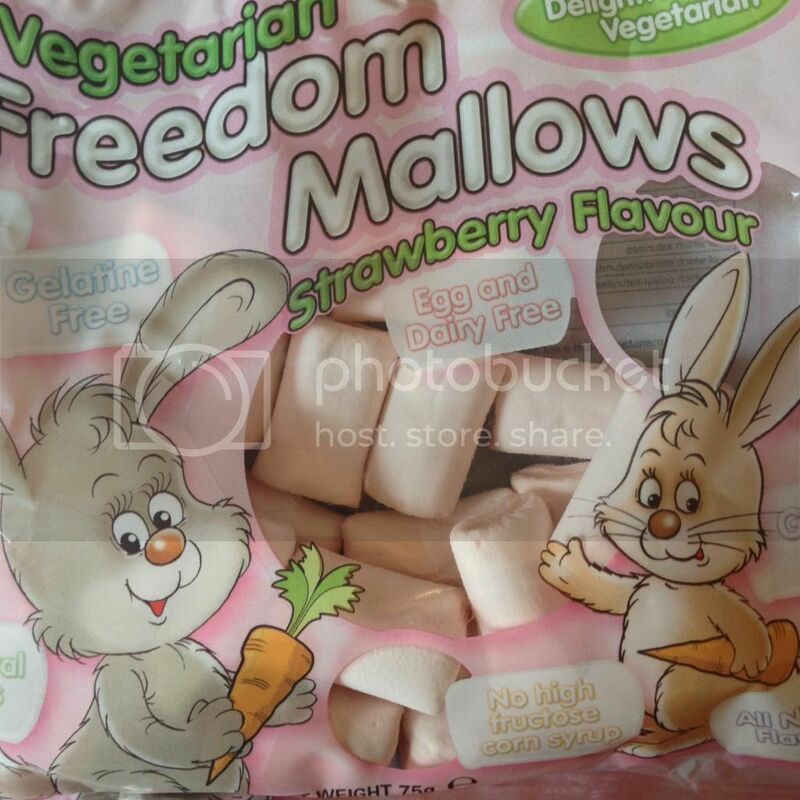 I've tried Freedom Mallows a few times before but I usually choose the vanilla ones, as I'm not a huge fan of strawberry-flavour things. (Real strawberries however, are amazing.) I think I tried a sample of the strawberry ones at VegFest last year, but I didn't really remember them... I really enjoyed these though! They had quite a perfumey smell which was a bit strong (but that's probably because I stuck my noes in the bag). They didn't taste perfumey at all. 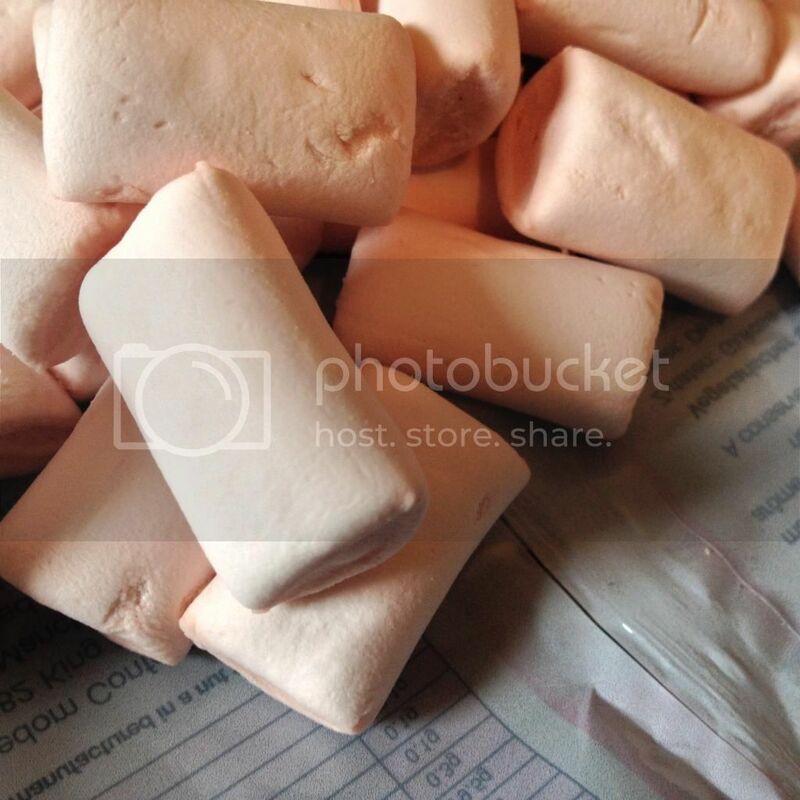 The strawberry flavour wasn't too pronounced, and they have the same good texture as the vanilla mallows. I should probably have saved them to bake in something but hey, I enjoyed eating them out of the packet. I've not tried these yet but they sound interesting. I've had a few different types of vegetable crisps but these sound like they will be a bit different as they are literally just pieces of mange tout and red pepper that have been freeze dried - crisps but not crisp shape. A while back, one of the Vegan Kind boxes had some soapnuts from Living Naturally - which I thought were pretty good. It's nice to see that they are expanding their range and offering more "normal" options that will hopefully entice the people who are sceptical of sticking some nuts into their washing load! I used these today and they seem to work well - it as a load of white towels and they all came out looking clean so I can't complain! They are so easy to use - just pop into the machine with your washing. This stuff is amazing. 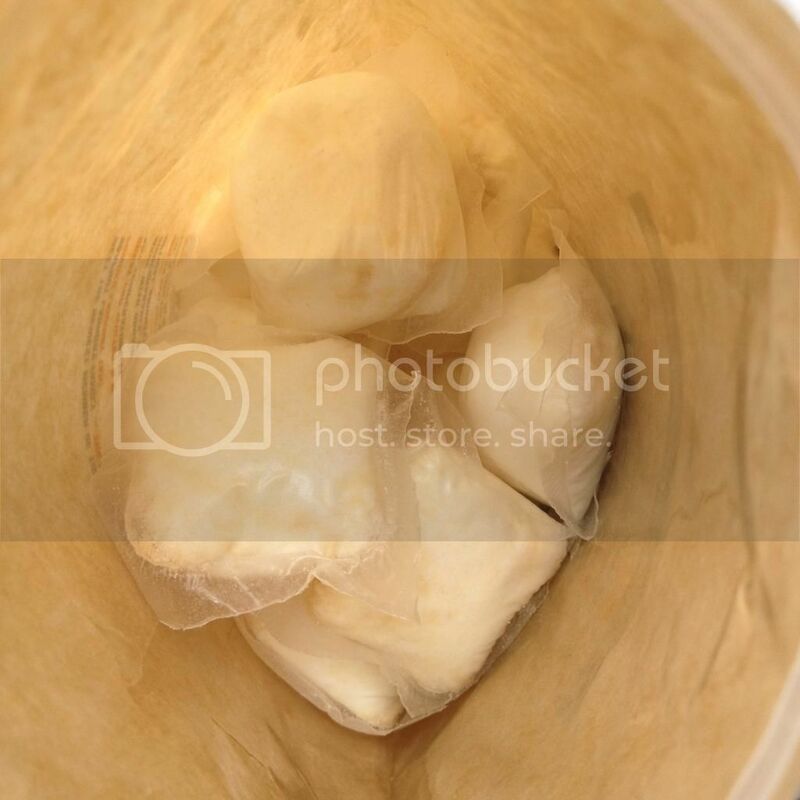 I love popcorn but am often disappointed by the bags that tout it as a "healthy option". I find a lot of them (Boots own brand especially) skimp on flavour to get the calorie content down. 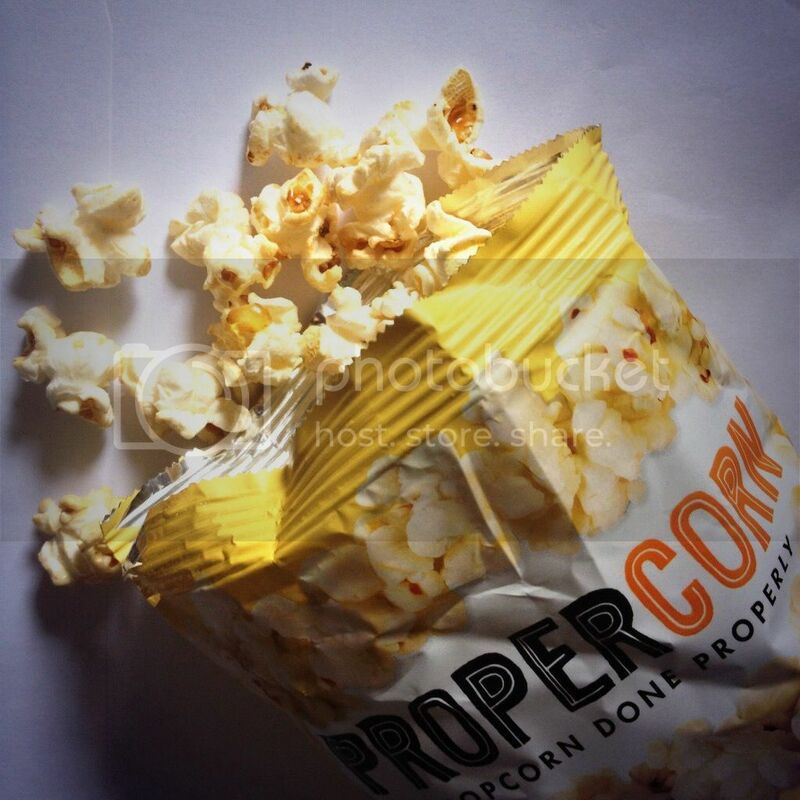 I can safely say that Propercorn don't do this - yay! The combination of sweet & salty was perfect and very flavourful, while still being a nice healthy(ish) treat. It's definitely a brand that I would look out for while out and about and in need of a snack. This is another one that I've not tried yet but it sounds very nice. The bar is enriched with raw rice protein, so I think I'll save it for a post-workout snack. TeenVGN is a social network for young veggies, and is a group I've seen at all the vegan festivals I've been to. 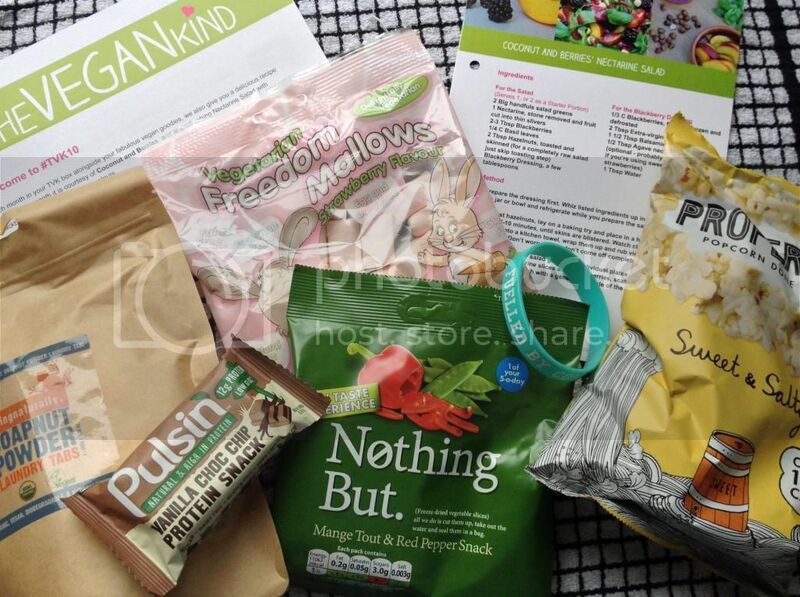 I love the wristband that has been included in this box, as I agree that I am "fuelled by compassion"! I don't usually wear wristbands like this, and I tend to forget about the bracelets that I have, but I will try to remember to wear this at least occasionally! This month's recipe card is for "Coconut and Berries' Nectarine Salad", which sound lovely! The charity of the month, who will receive 10p per box sold is Nut House Hen Rescue, who rehome ex-battery chickens. To sign up for the next box, just head on over the The Vegan Kind's website and you too can be the proud owner of one of these boxes, for just £10 plus p&p!